Belly Dance Urban Legends: Face or Fantasy? Which to Believe? Fact or Fiction: Which Belly Dance Urban Legends Should You Believe? Just because it makes a good story, doesn't mean it's true. Just because you want it to be true, doesn't make it so. 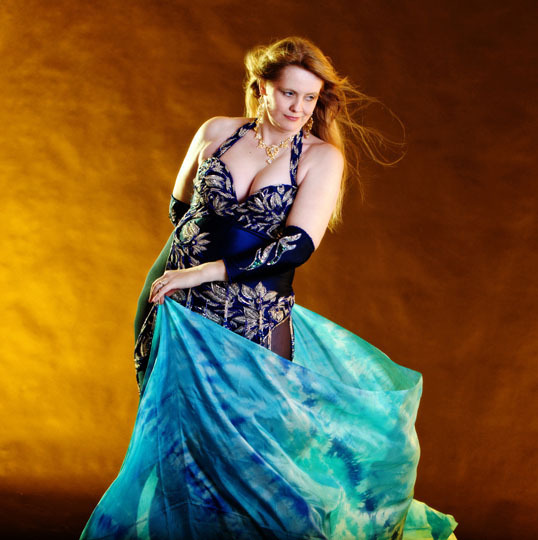 In the search for answers to questions they are asked by audience members, students, family, and others, many belly dancers have made up stories to explain why certain props are used, why certain costume choices are made, or why certain moves are done. The person who started a given story may have told her students, "I don't know. Perhaps it was because...." Over the years, that student may have passed it on to her students as a "fact" that she learned from her teacher, forgetting that it was presented to her as speculation. Other times, teachers just made up stupid stuff to avoid having to admit they didn't know, or perhaps to support the teacher's own agenda and belief system. This article exposes some of the widely-believed myths and provides the truth behind each. Although historical people in the Middle East didn't do a dance of the seven veils or wear belts made of camel tassels, there is no harm in modern-day dancers doing so. I'm not saying dancers who enjoy these modern-day non-Middle-Eastern additions to the dance should abandon them. However, I encourage you to learn the truth behind how these practices came into being, and pass that truth on to your students, friends, co-workers, and audience members. In that way, we can educate people about the true history of the dance and celebrate modern-day innovation at the same time. Urban Legend: People in ancient Egypt danced holding their shoulders, elbows, and wrists at right angles. Fact: So far, I have been able to find only one temple in image that shows the right-angle pose. See the photo to the right, which was taken at the Temple of Horus in Edfu. 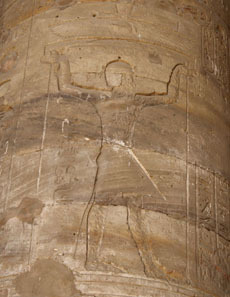 According to my Egyptologist tour guide, it shows a priest performing a sacred ritualistic dance. However, this tomb is the only place I've been able to find this specific dance with this posture. I have found many other images of dance at Saqqara and Luxor that showed entirely different styles of dance without this posture. Although we have evidence of one temple with this posture, it's clearly not a common or dominant image of ancient Egyptian dance. For example, the image below of a woman doing a backbend is more common — I have found it at the Luxor Temple and the Karnak Temple. As noted below, it also appears on a pottery shard. Urban Legend: Belly dancing was performed by priestesses in ancient Egypt as ritual to honor the goddesses. Fact: If belly dancing was an important part of ritual in the temples of Isis, Hathor, or other goddesses, then it would be logical to expect that there are images of belly dance in the temples and tombs which honor the goddesses. In my 4 trips to Luxor and my 3 trips to Saqqara, including the use of a private guide to lead me to images of dance and tell me what the surrounding hieroglyphic text said, I was not able to find any images resembling belly dancing. Instead, I found images similar to the one at the right showing dances of a more gymnastic character, such as the one in this image painted in the 13th century BCE on a shard of pottery found in Thebes (Luxor, Egypt). I saw variations of this backbend image on the walls of both the Temple of Luxor and the Temple of Karnak. The images I saw of priestesses typically showed them carrying offerings, not dancing. Could the performing art of Oriental dance as we know it have existed in ancient Egypt? To this, I would say no, because the Egyptian dance we know today arose from a major transformation starting in the 19th century, a transformation that was shaped in part by changing trends in music and audiences. However, I believe that some form of the solo, improvised, torso-articulated dance that served as the foundation for our modern-day art form probably did exist in Egypt in Pharaonic times. I have not yet been able to prove it, though I keep looking. Although it seems likely to me that the dance existed, I don't think there's enough evidence to support the idea that such dancing was used in temple rituals. In my opinion, it was probably just a social dance that everyday people did in their homes with friends and family, just as it is today. Urban Legend: Canes became a prop used in belly dancing as a miniature representation of the shepherd's crook used by women tending sheep in the fields. Fact: The Egyptian stick dance originated in southern Egypt, in the region known as the Said or Upper Egypt. The dance is inspired by a martial art known as tahtib. Egyptian men have traditionally carried long sticks with them which they used as weapons, and carried on the tradition of the tahtib martial art. In the 1960's Mahmoud Reda created a dance in which performers feigned fighting with these sticks. Women began dancing with canes as a way of playfully imitating men's use of sticks, and over time raks al assaya (stick dance) developed into a distinct women's dance. For more information about stick dancing, see Tahtib and Egyptian Raqs al-Assaya: From Martial Art to Performing Art. Urban Legend: The use of a stick in dancing is a phallic symbal. Fact: That partiicular urban legend appears to have originated from the book Grandmother's Secrets, which contains many questionable assertions about the history of Oriental dance. Fact: The stick is an everyday item, carried around by men for practical use as a walking stick, defensive tool, or otherwise useful object. In the eyes of Middle Eastern people, it does not carry phallic connotations. As Sigmund Freud once said, "Sometimes a cigar is just a cigar." Urban Legend: Mahmoud Reda invented stick dancing. Fact: People can be seen dancing with sticks in many older Egyptian motion pictures that were filmed before Reda Troupe's 1959 debut. For example, a man dances with a stick in the 1947 film Habib el Omr (Love of a Lifetime), and actor Rushdie Abaza dances with a stick in the 1957 film Tamra Henna (Henna Flower). Although Mahmoud Reda has certainly played a highly influential role in popularizing stick dancing and inspiring many of today's dancers, others performed with sticks before he created Reda Troupe. For more information about stick dancing, see Tahtib and Egyptian Raqs al-Assaya: From Martial Art to Performing Art. Urban Legend: The origin of balancing a sword on the dancer's head comes from the women who accompanied men into wars, and entertained them in their tents at night. Fact: There is no widespread dance in the Middle East today involving balancing of a sword on a female dancer's head. The primary historical evidence that has led modern-day dancers to treat the sword as a folkloric prop comes from a wonderful painting by the Orientalist artist named Jean-Léon Gérôme, estimated to have been painted around 1876. (See the image to the right, and click on it to see more detail.) This painting has inspired many modern-day dancers around the world to balance swords on their heads. 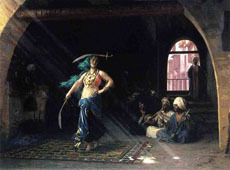 According to research by Yasmin Henkesh, Gérôme created several paintings featuring similar sword dances. At least two dancers in the U.S. (Leona Wood and Jamila Salimpour) claim to have "invented" dancing with a sword, inspired by this painting. Others have reported that they were inspired to do balancing based on their knowledge of this painting, without being aware that other U.S. dancers were doing the same. See the article Imagining Movement for an art historian's explanation of the historical context of this painting. It's reasonable to believe that at least one dancer (the one who inspired Gérôme's painting) indeed performed such a dance, and probably others in her community did as well. The dancer Morocco has found in her research that swords were once used in Oriental dance, but were abandoned when people replaced their swords with rifles. Fact: In modern times, sword balancing is not a commonplace part of a typical woman's dance in Egypt, Turkey, Lebanon, or other parts of the Middle East. Fact: There is an Egyptian men's dance known as el ard that involves holding the sword in the hand throughout the dance and executing fighting moves with the sword. A similar men's dance also exists in Saudi Arabia. But at no time do the men balance the sword on their heads (or anywhere else) when performing raqs el ard. Urban Legend: Belly dancing was widely used in the harems by women to get the Sultan's attention so he would choose them over the other women. Fact: In the large Ottoman harems, the women rarely even saw the Sultan. Decisions about which young women to introduce to him were often made by the Sultan's mother or first wife. So instead of winning the Sultan's attention through seductive dancing, the women of the harem were more likely to achieve their aims through gaining the confidence and support of his mother and/or first wife. Now, they probably did dance in the harem for each other's own entertainment to while away the long days. But it wasn't about competing for the Sultan's attention, because he would have been too busy with his duties as head of state to loll around watching dancing. Fact: Today, in the Middle East, women often dance for other women — for their friends, neighbors, aunts, mothers, and cousins. They use it to amuse themselves during the day while the men are out earning a living, after the household chores for the day are done. They use the dance to celebrate happy family occasions such as weddings, birthdays, and circumcisions. The women will dance with other women, and the men will also do Oriental dance, with other men. Urban Legend: Belly dancing was traditionally used as a dance of seduction. Fact: As noted above, in the Middle East, women often dance with other women at family gatherings, and men dance with other men. This has long been the tradition of their culture. Of course, it's highly likely that there were individuals who used this beautiful dance form to entice their husbands behind closed doors. 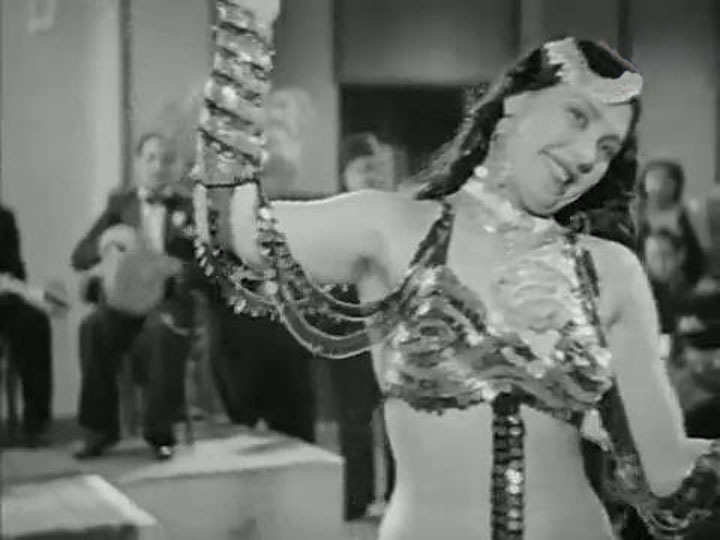 Also, sometimes in older Egyptian movies a scene will show a woman dancing privately for a man as a way of suggesting that intimacy followed. However, that is not how Oriental dance's overall place in society is viewed by the people who have actually grown up in Middle Eastern families. Women don't teach their daughters a "dance of seduction". Instead, the girls watch their mothers, cousins, aunts, grandmothers, and sisters dancing with each other at weddings and other parties, and imitate what they see. PHOTO CREDIT: Photo by Randolph Lynch, Redwood City, California. Urban Legend: The Dance Of The Seven Veils is a traditional dance from the Middle East, based on a story about Ishtar leaving a veil behind at each of seven gates as she descended to the underworld. Fact: The story of the descent of Ishtar was translated into English in the mid-19th century (so far as I can tell, around 1874). This story would have been known to the educated elite in Europe at the time. Fact: I have found no evidence linking the myth of Inanna/Ishtar to the Biblical version of the story of Salomé. I have looked. Fact: Greek art from the Classical period shows women appearing to dance with large pieces of fabric known as mantles. There is, however, no evidence of these "mantle dancers" as having incorporated removal of seven veils as part of their dance presentation. Further, there is no evidence linking these Greek "mantle dancers" to the Babylonian goddess Ishtar and the myth of her descent to the underworld. Although Greeks did have a goddess, Persephone, associated with an underworld myth, the Greek myth did not involve passing through seven gates, and there is no evidence of a Greek removal-of-veils dance commemorating Persephone's story. Fact: The notion that Salomé did a "dance of the seven veils" was introduced in the 1890's, when Oscar Wilde wrote a play about the loves of Salomé. He may have been inspired by reading the myth of Ishtar's descent, since it would have been known in the educated society of his day. Fact: Wilde's story was then directly used as the basis for an opera named Salomé written by German composer Richard Strauss. Strauss's popular opera helped spread Wilde's concept of Salomé peeling off one veil at a time until she was dancing naked before Herod. Later, Ruth St. Denis and Isadora Duncan incorporated "the Orient" into their own creative dance portrayals, and Hollywood picked up on the theme in some movies. A closer look at the "dance of the seven veils" appears elsewhere on this web site. Urban Legend: Belly dancing was brought by the Roma (Gypsies) from India to the Middle East. Fact: Africa had a history of dances that used hip movements long before the Roma (the name that many Gypsies prefer to use for their ethnic group) migrated west. The Turkish people danced with torso undulations long before the Roma migrated west. Although it's likely the Roma brought their own music and dance west with them, a strong local dance tradition existed throughout the Middle East before their arrival. As the Roma settled in various places that were already populated by other people, they learned and performed the local music and dance because that's what the locals wanted to hire. Fact: When comparing the Romany music and dances of Hungary, Romania, Bulgaria, Turkey, and North Africa, it is clear that there is little to no resemblance between the dances of these different regions. If the Roma truly had the power and the desire to imprint their own distinctive dance style from India in every place they lived, and to make that dance endure for many centuries, then we would expect to see nearly identical dances enduring today in all these places. This is not the case. Fact: This misconception probably came from the motion picture Latcho Drom, which was released in 1993. Latcho Drom shows music and dance from many countries where the Roma have lived in large numbers, including Egypt. Because it contains no voiceover or other narrative explaining what the onscreen imagery means, some people have speculated that it explains how the Roma influenced each place they lived. However, when you consider how vastly different the music and dance are in each locale that it depicts, a more logical conclusion would be to show how versatile the Roma were in learning to perform local styles everywhere they went. Urban Legend: The name "belly dance" comes from mispronouncing "baladi dance", which is the dance of the Egyptian people. Fact: In his autobiography, American impresario Sol Bloom claims responsibility for coining the term "belly dance". He says he did this when he was trying to stir up public interest in seeing the "Street In Cairo" exhibit at the Chicago Columbia Exposition in 1893. Bloom probably heard French people refer to la danse du ventre (which translates into English as "the dance of the stomach"), which was the name French colonialists applied to a specific abdominal control dance of the Ouled Nail. But the dance of the Ouled Nail that the French called la danse du ventre was a different sort of dance from what we think of today as "belly dancing". Sol Bloom is very unlikely to have known or cared what Oriental dance was called in its native home — he just wanted to attract a large number of curiosity-seekers to his exhibit to ogle the exotic dancers, and the word "belly" certainly provoked attention in an era when most proper women were laced up tightly in their corsets. Many modern-day dancers have observed the phonetic similarity between the words "baladi" and "belly", but this is only an interesting coincidence — there is no evidence supporting a cause-and-effect relationship. For more on the history of how the term "belly dancing" entered the U.S. vocabulary, see the book Looking for Little Egypt, which is reviewed elsewhere on this web site. PHOTO CREDIT: Photos by Pixie Vision Productions, Glendale, California. 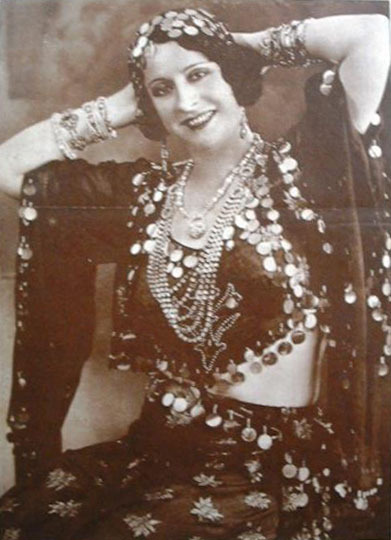 Urban Legend: Tahia Carioca made her debut dancing at King Farouk of Egypt's wedding in 1936. Fact: This misconception can be traced to Edward Said's article, "Homage to a Belly Dancer," which said Tahia Carioca made her debut at King Farouk's wedding. (4) However, Priscilla Adum has discovered in her research that this statement was incorrect. King Farouk did not get married in 1936. He could not. By Egyptian law he was required to be 18 years of age to get married. Since he was born in 1920, he was only 16 in 1936. The only important event in Farouk's life in 1936 was that he was crowned king of Egypt. His marriage however, did not take place until 1938 when he turned 18. This is well documented and there are dozens of pictures taken in 1938 of King Farouk's and Queen Farida's wedding ceremony. If Tahia danced at his wedding, then it was in 1938 and not in 1936 as stated by Edward Said. The words "made her debut" in Said's article are also misleading, as Carioca was already working for Badia Masabni starting in 1933. 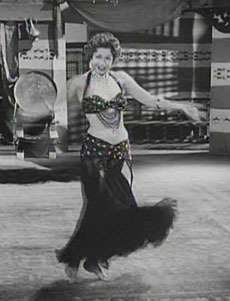 ABOUT THE PHOTO: This photo shows Tahia Carioca performing in the 1951 motion picture Shatie el Gharam (Shore of Love). 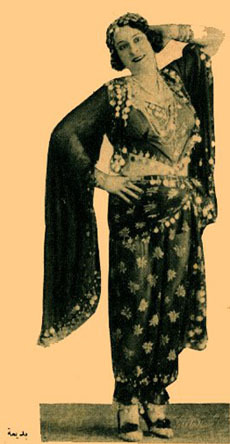 Urban Legend: Badia Masabni opened the very first nightclub featuring belly dancing in 1926, which was the Casino Opera. Fact: Egyptian nightclubs featuring dancers as entertainers already existed in the 19th century. Shafiqa el-Koptiyya, for example, performed at the El Dorado. 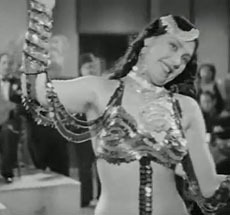 For more information about Shafiqa el-Koptiyya's career as an early Egyptian dance star, see The Dancer Whose Horses Drank Champagne. Fact: Badia Masabni operated several nightclubs over the years, including ones in Alexandria, Giza City, and Cairo. The one she opened in 1926 was Sala Badia, which was located on Emad El Din Street where many other clubs already existed. Initially the club featured singing and Vaudeville-style skits. Badia hired her first dancer in 1927, which was Afranza Hanem. Badia didn't open the Casino Opera at Opera Square until 1940. For more information about Badia's career as a nightclub owner, see Priscilla Adum's article, The Lady and Her Clubs. ABOUT THE PHOTO: The woman in this photo is Badia Masabni. Urban Legend: Samia Gamal was the first dancer to wear high-heeled shoes, and her reason for doing it was to prove she could afford them. Fact: Many Egyptian dancers wore high-heeled shoes before Samia Gamal. For example, one of the stories told of the famous 19th century dancer Shafiqa el-Koptiyya is that the heels of her shoes were covered in real gold. Fact: In a 1968 interview, Samia said that other dancers had teased her about being unable to afford shoes after a director had asked her to dance barefoot in the 1945 movie El Hob El Awal (First Love). Perhaps a misunderstanding of this anecdote led to this urban legend. 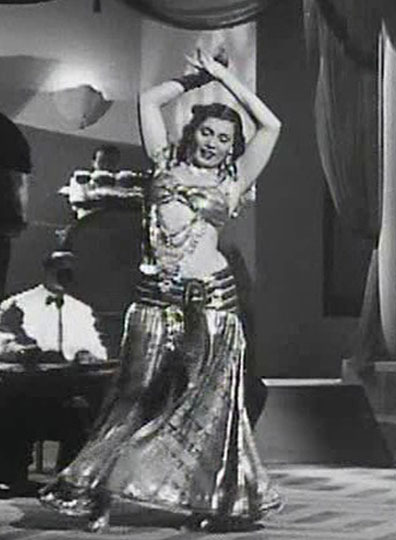 ABOUT THE PHOTO: Samia Gamal dances in a scene from her 1955 movie Sigarah wa Kass (A Glass and a Cigarette). Fantasy: A dancer should never show the palms of her hands to the audience because doing so is highly offensive to Arabs. Fact: There is nothing inherently offensive about the palm of the hand. Dancers do not need to tie themselves in knots to avoid letting their palms be seen. However, holding the hand with palm facing directly to the audience with the fingers splayed is a poor choice simply because of being unattractive. (See the "robbery victim" arms in the photo to the right for an example of how unattractive such a hand position can look.) It's not culturally offensive, but it's not attractive to look at, either. Also, the "stop in the name of love" arm position is a very aggressive gesture, which is seen as offensive in some cultures such as Greece. But if the palm is visible while doing soft, attractive hand gestures, nobody is likely to be offended. For more detail, see Is It Okay to Show My Palms to the Audience While Dancing? elsewhere on this web site. Urban Legend: Never point your toes in belly dance. This is a ballet-influenced technique and Middle Eastern people don't like it. Fact: Dancers in the Middle East sometimes point their toes while performing Oriental dance and sometimes don't. It depends on what kind of music they're using, what kind of aesthetic they are aiming for, and what kind of personal preference an individual dancer may have. Some will point their toes for a highly-orchestrated Oriental entrance while dancing flat-footed for more folkloric pieces such as baladi. Others will dance either pointed-toe or flat-footed throughout a show. However, a Middle Eastern dancer will typically use only demi-pointe (ball of the foot resting on the floor); i.e., a Middle Eastern dancer will normally not use full point (only the tips of the toes resting on the floor). ABOUT THE PHOTO: Samia Gamal dances in a scene from Sigarah wa Kass (A Glass and a Cigarette). Urban Legend: Never let an audience see the soles of the feet, as this would be offensive. Fact: It is true that it would be very offensive to sit on the floor in a way that points the soles of the feet directly at someone else, and therefore a dancer should avoid doing so when performing floor work. However, there is nothing wrong with the audience seeing an occasional glimpse of the sole of the foot when a dancer is doing moves in a standing position, such as Saidi-style step-lifts, debke footwork, traveling steps, etc. such as this picture shows. Urban Legend: Professional dancers always choreograph. Fact: Oriental dance originated as an improvisational dance form. This statement might be mostly true of Western dance styles (ballet, modern dance, or jazz) but it doesn't really apply to dancers from the Middle East performing Oriental dance. Dancers such as Fifi Abdo and Mona el-Said nearly always improvised the bulk of their shows. 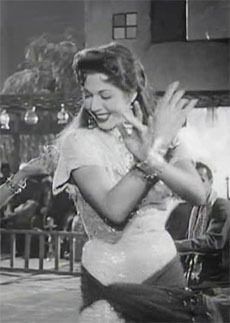 Mahmoud Reda once commented on his frustration of trying to create a choreography for Samia Gamal, because she was an improvisational dancer at heart. In nightclub performances, Oriental-style dancers tend to interact with the audience, and improvisation is needed for this. Fact: Some dancers from the Middle East have incorporated choreography into their shows, particularly their orchestrally-complex entrance pieces, but even then they'll often use the choreography as a framework and in the moment will add spontaneous touches such as a hand gesture or head movement. Urban Legend: Egyptian dancers never do floor work. Fact: While it's true that floor work was largely banned in Egypt in the 1950's, Egyptian dancers can still sometimes be seen doing floor work today. It depends on the situation and what the dancer wants to do. Fact: When the Egyptian dancer is outside of Egypt, there is no need for her to conform to Egyptian laws. 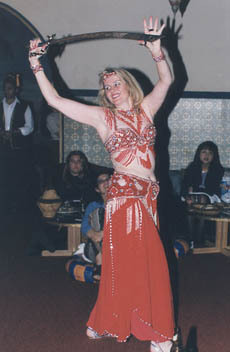 An Egyptian dancer performing in Lebanon, or the United States, for example, is free to do floor work if she chooses. It then becomes a matter of the dancer's choice. Fact: A limited amount of floor work is still permitted in Egypt in conjunction with performances using a shamadan (candelabrum). That's because raqs al-shamadan is seen as "traditional", and the type of floor work movements that part of the traditional dance are still allowed with it. For example, a dancer performing raqs al-shamadan could legally do the splits and bend the back knee to touch her foot to her head. Fact: The vice laws that apply to dancers in Egypt are specific to dancing in public places. They don't apply to private parties such as weddings held in locations where the public is unlikely to see the dancer. Fact: Sometimes dancers choose to disobey the law and do something that technically is forbidden, then pay the fine later. Urban Legend: Shimmy the shoulders, not the bustline. Fact: Egyptian dancers power their upper body shimmies from the mid-back, which causes vigorous movement of the bustline. However, many American dancers teach that the shimmy should be done higher up, at the shoulder level, because they feel too inhibited to shimmy the bustline. While there may be some communities in which a vigorous bust shimmy might make the local non-Middle-Eastern audiences uncomfortable, ethnic audiences will embrace the move as being a normal aspect of the dance. Urban Legend: Never cross the center of the body with the arms. Fact: The rule of not letting arms cross the center of the body applies to classical ballet arm positions, and it is known as "the classical modality". The primary people teaching this urban legend tend to be those who have studied classical ballet and their students. But ballet is entirely different from Oriental dance, and its arm rules don't apply to Oriental styling. Fact: Dancers from the Middle East frequently permit their arms to cross the center of the body. For example, see the photos of Tahia Carioca and Samia Gamal earlier in this article. Urban Legend: Middle Eastern people use the zagharoot to applaud a skilled dancer. Fact: The zagharoot (plural zaghareet) is a ululation that Arabs occasionally use. It can be used to express joy (for example, at weddings, or upon receiving delightful news) or grief (for example, at a funeral, or as a farewell). It is not used as a tool for applauding a belly dancer. If zaghareet are heard during a dance performance, the motive is due to expressing joy rather than due to applause. For more information about showing appreciation for dancers, see How to Be an Appreciative Audience Member. Urban Legend: Middle Eastern people hiss like a snake to applaud a dancer doing sinuous undulations. Fact: Most Middle Eastern people would consider hissing at the dancer to be an insult. The idea of hissing to acknowledge a dancer's snake-like moves appears to have originated in San Francisco, California. For more information about showing appreciation for dancers, see How to Be an Appreciative Audience Member. Urban Legend: Professional dancers in the Middle East always wear shoes. Urban Legend: It's better to dance barefoot because that's more authentic. Fact: Many professional dancers in the Middle East wear shoes, some don't. It depends partly on local audience tastes, and partly on dancer preference. For example, dancers in Turkey and Lebanon almost always wear high-heeled shoes, whereas a number of dancers in Egypt over the years have chosen to dance predominantly barefoot. See the photo of Samia Gamal above for an example of an Egyptian dancing barefoot in a movie scene, though Samia usually wore shoes to dance in her nightclub act. The Egyptian dancer Dina usually chooses to dance barefoot. See Costuming for Your Feet for more detail on this subject. ABOUT THE PHOTO: The Turkish dancer Nejla Ates wears high heels in a scene from the 1950's motion picture Son of Sinbad. Urban Legend: The coined hip scarf was invented by dancers who traveled to Egypt with the dancer Morocco in the 1970's. Fact: There are many photos of Golden Era dancers in Egypt wearing hip scarves with coins, such as the photo to the right of Badia Masabni as a young woman. There are also many movie scenes showing dancers from that era wearing such hip scarves, such as the one appearing earlier in this article of Samia Gamal from Sigarah wa Kass (A Glass and a Cigarette), a 1950's movie. Clearly, hip scarves with coins were sometimes worn by dancers in the Middle East before the American dancers to whom this story is attributed went on their visit. Fact: This urban legend can be traced to a visit by the dancer Morocco's group to Khan al-Khalili in Cairo, where they encountered Mahmoud Abdel-Ghaffar, which is described on Morocco's web site. The innovation that arose from their visit was to create an industry of exporting ready-to-wear dance attire (including hip scarves) from Egypt to countries all over the world. Before this, dancers desiring Egyptian-made hip scarves and costumes needed to work directly with designers to order customized items. Mahmoud's shop, Al Wikala, was the first business to export ready-to-wear dance gear worldwide in this new industry, but many others have since followed. 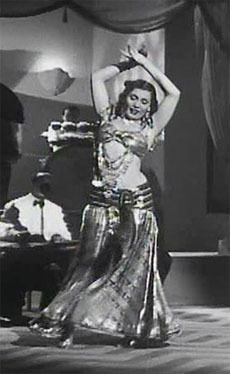 Urban Legend: Jamila Salimpour invented the use of the coin bra as a belly dancing costume item. Fact: Coin costumes were very much part of the wardrobe of Golden-Era dancers in Egypt. In her research, Priscilla Adum has documented many Egyptian motion pictures showing dance scenes in such costumes decades before Jamila Salimpour became interested in Oriental dance. 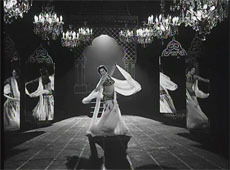 One such example is this scene showing Taheya Carioca in the 1941 film Leyla Bint al Reef (Leyla, Daughter of the Country). Priscilla notes that this costume features thousands of tiny metal coins. She wears matching earrings and a matching coin necklace. Her bra is connected to the cuffs by looped swags and everthing is covered in small coins. Wendy Buonaventura, Serpent of the Nile: women and dance in the Arab world, Interlink Books, 1990. Bible. Matthew 14:6-11 and Mark 6:21-28. Edward Said, "Homage to a Belly Dancer," Reflections on Exile: And Other Essays, page 146. The Oldest Dance? Really???. Avoid the trap of believing "wishtory" (wishful thinking about history). Costuming Fact or Fiction: Which Costuming Lore Should You Believe?